Volume 2 This DVD contains 3 “Total Body Sculpt with Gilad” workouts as seen on FitTV (shows 1, 2, 3). Workout # 1: SHOW #1. Abs, Buttocks & Biceps. (23:30). Begins with a warm- up, followed by circuit training using light to medium hand weights then focuses on abs, buttocks and biceps. Workout # 2: SHOW #2. Thighs, Abs, Shoulders & Triceps. (23:30). Begins with a warm-up, followed by circuit training using light to medium hand weights, then focuses on thighs, abs, shoulders and triceps. Workout # 3: SHOW #3. Abs, Thighs, Buttocks, Biceps & Triceps. (23:30). Begins with a warm-up, followed by circuit training using light to medium hand weights, then focuses on abs, thighs, buttocks, biceps and triceps. Thanks for a great transaction! It was quick and easy to search the videos' content to find the exact volume I wanted. The shipment arrived on time, and I'm really enjoying the video. Just started a few weeks ago. It is easy to follow and very enjoyable. I purchased a complete Total Body Sculpt package. The Volume 2 DVD was not good. I returned it only to receive another DVD that does not work. There are obvious defects in the DVD. 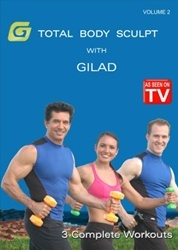 Dear Gilad, I have been working out with you for 5 years! Nothing else has shaped my body the way your workouts have! I have to say though that the last dvd i ordered was a bit disappointing in that the work outs are too similar. The warm ups sections are the same. Sometimes I do 2 in a row for a total of 50 minutes and I feel like it's repetitive. I am also disappointed when part of the work out is cut off because it originally went to commercial. So I have to pause my tv to actually complete the work out on the other side. I was much more satisfied with total body sculpting plus that I ordered in the past. All 3 of my girls work out to Gilad videos too and btw the shipping timing was great. Thank you Gilad!